I cannot find an option that corresponds with my distributor on http://www.hot-spark.com/1-bmw.htm. My distributor's p/n is 0 231 168 021 which does not appear there. Does this mean I'm out of luck or will one of these still fit? My car has a 2.0 M10 out of an E21, not the original engine. I imagine that might have something to do with this. Attached is a picture of my distributor. I've got that same distributor on my engine. There is a date code cast on the inside of the case from 1996 on mine. It is on the bottom though, so you'd have to take it apart to check yours. (Being thirty years newer than the car implies that it might not have a lot of wear). Originally, my '76 came with a # 0 231 179 164 distributor which is also a vacuum advance model. The points plates are the same in both distributors, as are the points and cap, etc; so I would think that they would use the same Hotspark. Sad to see another set of points put on the shelf. You can leave the condenser hanging there, so you'll still l@@k like one of the cool kids. I don't suppose you've put a variable timing light on it, to see how it's behaving, have you? No I haven't had access to one. I suspect the timing is less than perfect. The engine is recently rebuilt, new carb, new plugs, new plug wires, but I seem to be getting occasional RPM irregularities and misfires (usually on a cold engine or on short trips [engine is run for ten minutes to drive to a shop or something, then restarted after a few minutes in the shop, etc], sometimes if I have I pushed her a little too hard when cold) so I suspect it is time to either have the points adjusted or go electronic. A variable advance timing light will tell you a lot about how that distributor is behaving. Setting the timing will be part of the tune up procedure with either points or electronic ignition, so the light will be useful either way. If you want to maintain points, this light also has a built in dwell meter; as well as a tachometer and a volt meter. $95 delivered to your door seems like a very good value. you always have to pay attention when dealing with e21 cams & distributors. In the production time of e21 the distributor changed from turning right to left. There is a little arrow on the side of the distributor, indicating that it is meant to spin clockwise, but I suppose it is possible that a previous owner put a counter clockwise gear on it, to go with the later style e21 camshaft; but the advance weights would then be retarding the ignition with increasing rpms, which would make it run pretty crappy. I suspect the timing is less than perfect. The engine is recently rebuilt, new carb, new plugs, new plug wires, but I seem to be getting occasional RPM irregularities and misfires (usually on a cold engine or on short trips [engine is run for ten minutes to drive to a shop or something, then restarted after a few minutes in the shop, etc], sometimes if I have I pushed her a little too hard when cold) so I suspect it is time to either have the points adjusted or go electronic. 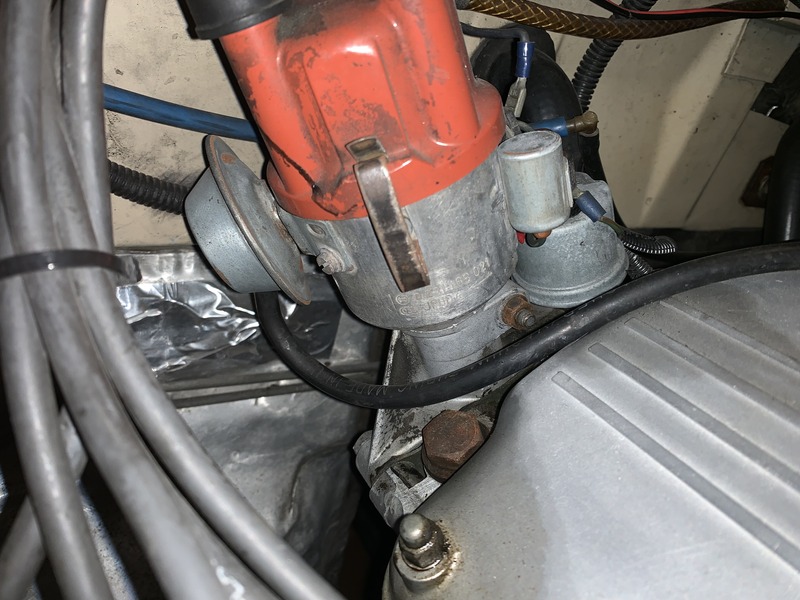 Your symptoms sound like more of a carburetor issue to me, but step one is to make sure the timing is correct, then move on to the carburetor. Since this thread is about ignition concerns, I'll leave it to you to ask about the carb., or to provide more information about what you have. If the distributor's center post's cam section is worn down, going electronic makes sense; since the magnetic ring is not affected by that the way points are. If that cam is rough or rusty at all, it will cause the rubbing block to wear down quickly, changing the dwell, which in turn changes the timing and it is like chasing your tail, trying to keep it set. Distributors require maintenance. Removing them from the head is easy, once you understand that the only thing that really matters is that the rotor face the same place on the body/cap when it is put back in. Distributor position also matters with regards to keeping the points up front/accessible. Yours has been installed that way as it sits now. If you were to use a sharpie pen to make a mark on the distributor body where it meets the flange and carry that mark down onto the flange, that will let you put it back where it is now if you take it out. At the same time you should make another mark on the upper rim of the body, just under the rotor's tip. Then you can loosen the clamping bolt and pull it out for inspection/servicing. When reinstalling it, you simply insert it with the rotor slightly turned off to the side (ccw) from where you want it and it will rotate that little bit as the gears engage. Once out, you can measure the play between the body and the gear/washers. There are two fiber washers, one inside and one over the gear. The inside one typically fails, creating too much play, which translates into an inaccurate spark; seen as a bouncing mark under a timing light. The points plates in a vacuum advance or retard distributor are two pieces that need to move smoothly. They can be removed and serviced without taking the whole thing apart. If they have been neglected for a long time, they will wear out. (Unfortunately, I have five vacuum advance distributors and only two sets of good points plates). Posting a photo or two showing the center post and points plates might be helpful. Sorry but someone had to say it. Look at a 123 dizzy. Keep your original one tucked away in a nice box. Look at a 123 dizzy. Meh, I wouldn't run one if you gave it to me. Points and condensers + weights and springs = shits and giggles. Freakin' Prius parts don't belong on 2002s. Ha! You and me both. And we're working on coil on plug as well... If I'm going to have an ECU, may as well have it work as good as it can. Rotor 04 044 for the 081 and or dist 003. either rotor might work or fit.